Dwarf Orange Cream originated from a cross between Golden Dwarf Champion and Elbe made by Patrina Nuske Small in 2006 named Tipsy F1. Dwarf Orange Cream is a mid-season rugose potato leaf dwarf reaching about a metre+/ 3-4 ft by end of season. Fruits are medium-large 8 – 12oz smooth oblate pale orange, and have an intense taste with a lively tang. They have a nearly matte, dull appearance. 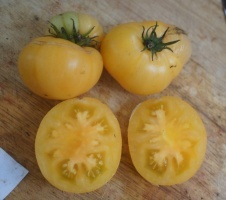 This variety was selected and named by Craig LeHoullier who co-manages the Dwarf Tomato Project with Patrina, and he says Dwarf Orange Cream is among the best of new dwarfs from the project.